Earlier this fall, I underwent a major operation on one of my hip joints. Since that day, I have been in physical therapy and begrudgingly using crutches. For just over a month I was on medical leave and preparing for a job transfer within the University of Virginia. This week is my first week in my new position with the Department of Emergency Medicine. 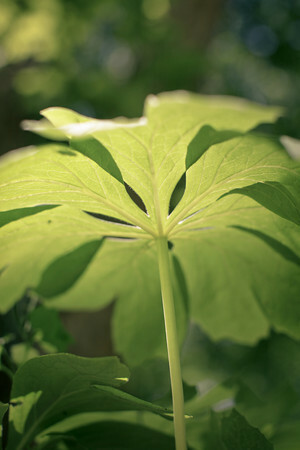 This post’s photo is of Mayapple, a native ground cover found in Virginia. According to an article by the Master Gardeners of Northern Virginia, the fruit produced is edible (not shown). However, the other parts of the plant are poisonous and should not be consumed. Featuring this image ties in with my new position with UVA. But how so? One aspect of Emergency Medicine is the division of Medical Toxicology. A program within MedTox is the wilderness medicine course offered to university students. As an administrative assistant, I will be educating myself on every aspect of UVA’s Emergency Medicine department and any related services (including the wilderness medicine course that is spearheaded by Dr. Nathan Charlton and Dr. Christopher Holstege). Besides some general administrative work, I will assist with the online presence of the department and the representation of its services. I am looking forward to furthering my software and writing skills. I am also looking forward to any medical knowledge that I may acquire along the way. My previous work with doctors and clinical staff has proven that proximity is a great opportunity for learning. A particular topic that I may have the opportunity of learning more about is natural toxins. As I am sure you have noticed, I take a strong interest in nature and gardening. I am already aware of some natural toxins – especially those in plants. Examples include foxglove, mayapple, hydrangea, poison ivy, castor bean, and hemlock. Although I am a bit intimidated by a new position’s expectations and responsibilities, I am positive that it will exercise the parts of my intellect that have been needing more stimulation and challenge. As I delve more into online management, I may post more on my own blog to practice certain features of WordPress and formatting before going live on the department’s platform. (Disclaimer: I will not be sharing department articles on my private blog, but merely practicing settings inherent to WordPress). Thank you for stopping by today. Wishing you and yours a merry Christmas! Previous ArticleWho is taking care of you?